The engineers from SB Components decided in 2016 to develop a modular phone system for their Raspberry Pi single board computers. The main requirement was modularity so that any user could bring the functions they wanted to the system. The group is currently running a Kickstarter campaign to fund PiTalk, their modular smartphone for Raspberry Pi. 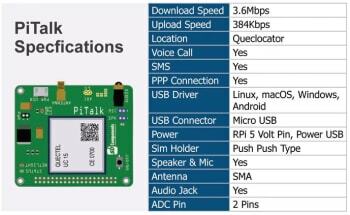 PiTalk is built off of the Python platform and compatible with Raspberry Pi Zero, 2 and 3. The base shield comes with a 3G module for voice and data, but the campaign page says that the system is also compatible with 4G. PiTalk developed its own software to control the phone, and plans to release the code to GitHub once the system is launched. 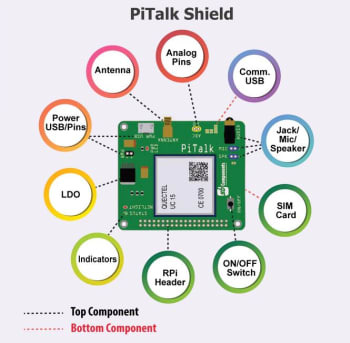 The PiTalk shield is the main innovation here, featuring a power switch, audio connectors, antenna, SIM card, and status lights. The barebones Kickstarter offering is just the shield and the antenna but other packages offer the LCD screen, camera, or automation kits. PiTalk is shown sending and receiving calls and texts in the campaign video, along with a demonstration of home automation showing a bulb being turned on and off through the device. Modularity and customization are the main reasons I can see PiTalk appealing to makers and hobbyists. An operating system that allows users to change almost every aspect of the phone is a big plus for coders and people who feel their phone is great except for one small detail. The ability to add any size screen or any resolution camera is also a great design benefit. Several internet of things applications and ideas for apps are also on the campaign page, but nothing completely new. One thing I'd love to see from this idea that isn't present yet is casing. As a company I've known SB for its Pi project cases in a variety of custom colors and sizes. This campaign is appealing to makers and customizers but it seems like showing biggest and smallest possible sizes in their colored transparent cases would give some visual appeal. The campaign ends on January 7 and if successful first units are expected to ship in March, 2018.